This Wednesday, 3 May, Mercury turns direct in Aries. You read that right – the second Mercury retrograde of 2017 is officially over. The post-retrograde shadow period lasts till 21 May but we can still celebrate, right?! Mercury rules communications, travel and technology, so now that it’s moving forward, we can look forward to improvements in these areas of our lives – and it’s a good time for us to try moving forward too. LEFT: NINE OF PENTACLES. Take a bow, dear reader. The Nine of Pentacles is here to cheer you on – this card is indicative of reward, respect and recognition in an area of your life that you’ve been working on. The fruit of your labour is either here, or on the way; keep pushing forward if you haven’t quite crossed the finish line yet. Success is well within reach! MIDDLE: SIX OF CUPS. Recalling the simple pleasures in life? When the Six of Cups appears, there’s a distinct sentimentality in the air, a fond nostalgia for the good old days. This is the card of reconnecting with people from your past, the children in your life, or your own inner child. 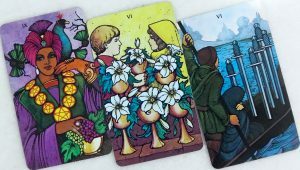 This card can be associated more with a yearning for the past, rather than an actual link – in which case, the question to ask would be: What do you desire in order to move forward? What do you desire in order to move forward? RIGHT: SIX OF SWORDS. Because moving forward is really the only way to go, isn’t it? The Six of Swords indicates needful change for the better. If you desire career success, loving relationships, financial freedom, weight loss, children, etc – that’s all good, but darling, everyone desires their own good. What, then, would make you different? What is it that can give you a greater chance at success, while the rest of the world just sits around and dreams? The six of Swords tells you what it is. it’s the willingness and ability to change. The flexibility to adapt, to evolve, to work around constraints. The courage to forge a new path and explore unknown horizons. That’s what it takes to make your dreams come true. This week, we put our noses to the grind and plod, diligently and conscientiously, through Taurus season. Let this week be one where we are mindful of what we do and are willing to modify our approaches in order to achieve the joy and accolades that are promised.